All right, I'll cop to being wrong on this one. After FIFA 18, I wondered if the series might be one-and-done on the Switch. Producer Andrei Lazarescu even teased me a bit about it, saying that it motivated the team to make an even better game. So here we are, FIFA 19 is on Switch, and it already looks better than last year. While a move to Frostbite to match its brethren on PS4, PC, and Xbox One remains unlikely, Lazarescu says the team has gone out of its ways to polish up the visuals. It's apparent in the demo build that I played at EA Play earlier today, which already looks much crisper and clearer than its predecessor. It obviously can't match the graphical prowess of the other consoles, but the gap doesn't feel nearly as wide as last year. "We never thought about improving any one thing from FIFA 18. We thought, 'How can we bring that experience one level up.' And I think everything we did with that in mind while still keeping to the uniqueness of the platform," Lazarescu says. "Online friendlies, for sure, it's a thing that players wanted. They wanted the ability to play with friends online. But in terms of gameplay, we wanted the game to feel with every match. We did a lot of things with shooting. You'll also find that besides Champion's League, we're doing a lot with the presentation—La Liga, Bundesliga, Premier League, all of those." AI is getting a boost as well. FIFA 19 on Switch will have its own form of Team ID, which is designed to make them play more like their real-life counterparts. Just don't expect The Journey, the single-player mode starring international superstar Alex Hunter, in this version. Asked whether the mode would eventually make it into FIFA for the Switch, Lazarescu laughed, "Who knows? Maybe, but it relates to last year as well—we intentionally chose to create a custom experience on Switch because we were looking for a flawless 60fps experience. Maybe there are some gaps between our custom engine and the Frostbite Engine, but every year we're not just looking to add more future, we're also looking to build up the engine to cover those gaps. And it's just Year 2, after all." I'll admit to being fairly harsh on FIFA on the Switch in the past. I didn't think it really played to the platform's strengths, and I expressed doubt that Ultimate Team—the franchise's moneymaker—would be able to garner a fanbase on Switch. But Lazarescu has an energy that find infectious. It really does feel like they're committed to making this franchise work on Nintendo's platform—a marked improvement from the Vita, where new entries were largely limited to roster changes. 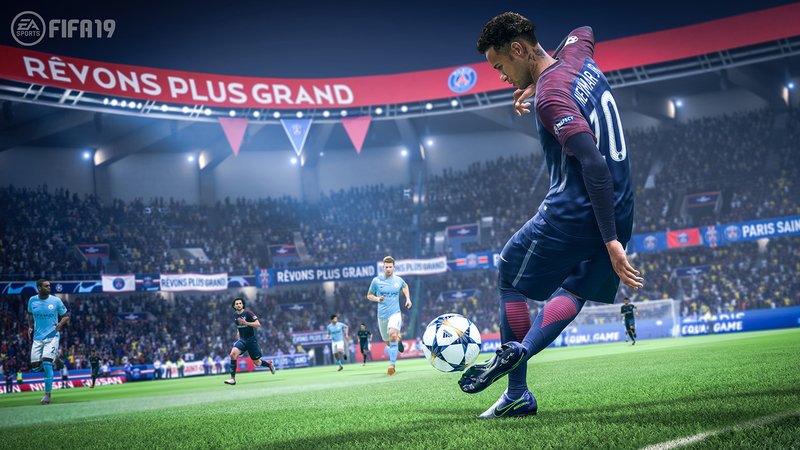 FIFA 18 on Switch even joined the PS4, Xbox One, and PC versions in getting the recently-released World Cup add-on. Even Ultimate Team seems to be doing okay. Despite comparatively low concurrent player counts in FIFA 18, Lazarescu says that it's still FIFA's most popular mode on Switch. "Of course. It's Ultimate Team!" So credit where credit's due: EA isn't just sending this version out to die. And with some improved visuals and other interesting tweaks, I may actually pick this version up again after quickly bouncing from last year's release. As usual, FIFA 19 on Switch will be out around the same time as the other versions. Here's everything we know about FIFA 19 so far as well as a breakdown of the new tactics screen. Tagged with Analyses,	E3 2018,	fifa,	PlayStation 4,	Sports,	Xbox One.